Filling and packaging ‘black gold’ is a pleasure of its own kind. A tankful of emptiness gave a hundred advices. But giving up wasn’t one of them. 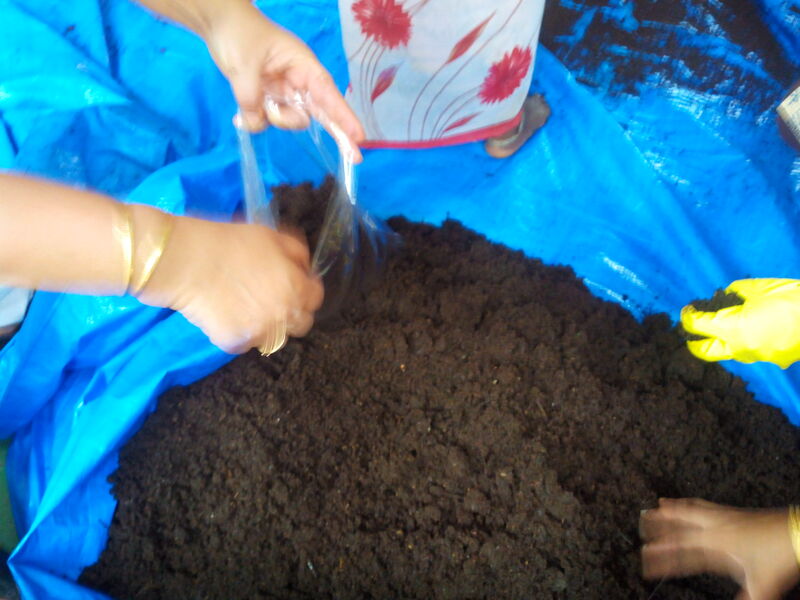 The second large-scale vermi-composting experiment began in our community with utmost diligence, avoiding repetition of the all the mistakes that doomed the first one. Loads of garden leaf litter was dried in the sun and mixed with bags of cow dung slurry. It was churned a couple of times and let to stay. After 20-odd days, it turned into a nice-smelling black substance and this semi-compost was ready to receive earthworms. This time the worms entered the bed without much fanfare. We kept a close watch on the moisture levels. The worm population seemed to grow by the day. Within 7-10 days, the top leafy layer was transformed into tiny black granules of almost equal size and the red wigglers were snaking they way into the middle layer. The smell of the fresh cow dung was slowly vanishing, making way for a faint wet-earth smell. After nearly 35-40 days, I dug my hands into the tank and there was hardly anything left for the worms to munch on. We placed cow dung balls at the bottom of the tank to let the worms settle in and left the tank undisturbed for a week. The sieving ritual was a celebration of sorts. It was such a joy to take out the cow dung balls filled with worms and sprinkle them into another semi-compost bed prepared 20 days ago. All those extremely tiny wigglers which couldn’t enter the dung lumps were taken out gently while sieving. Over 300 kgs of black gold fell like teeny-weeny raindrops from the large sieve. The aroma of the fresh, mature compost was like that wet earth after the first summer rains. It was the aroma of perseverance. Many myths were busted, once and for all. Vermicomposting can be done by those who knew nothing about it just months ago. It is doable in an urban milieu and is no big deal if you are ready to put up with the initial travails. Above all, you do not have to surrender yourself to the fateful limitations nursed by naysayers but rather turn them into stepping-stones to come up with something as priceless as this. If succeeding is the coming together of all that is beautiful, as Lao Tzu says, then this was precisely it. “Going Organic” is a series of articles based on my personal experience of turning our manicured garden, used to synthetic fertilisers and pesticides, into completely organic with the help of like-minded enthusiastic volunteers. 1. GOING ORGANIC-7: Large-scale effort, large-scale failure as vermi-compost experiment #1 goes haywire. This entry was posted in Endlessly Green, Free Flowing and tagged black gold, cow dung, mature compost. Bookmark the permalink.